On this diet, there are no gimmicks, no food-combining, no calorie-counting, no classes to attend and no sponsors. The only thing required is for you to be passionate, prepped and ready to change your life with a little help from me and Mother Nature, who provides the most glorious foods. Initially the Drop Zone Diet was designed for celebrities and models to use before a photo shoot, casting or filming, to help them drop weight rapidly whilst looking amazingly vibrant, fit and healthy. Many of these women were eating as little as possible in an attempt to lose weight quickly. However, the tiny quantities of food they were eating were so nutritionally poor, they were left feeling exhausted and depleted. Many gave in to night-time binges because their bodies were in desperate need of fuel. The truth is that these girls didn’t look their best, because nutritious food is necessary to get that glow of good health. As a biochemist, I knew that I could design a diet with a minimum of calories to help support quick weight loss, and I also knew how to make those calories work hard! Everything in the Drop Zone Diet has maximum nutritional impact, so that your body is being fed the most amazing superfoods as it lets go of old fats and toxins. The results spoke for them- selves. People finished the diet looking vibrant and healthy, and feeling energized, fit and well. Best of all, they slept better, had clearer skin and were committed to eating well to continue experiencing the results! The truth is that no advocate of healthy eating happily recommends a rapid weight-loss diet. I’d much rather encourage people to lose weight as part of a holistic, healthy lifestyle; however, there is a growing and insatiable desire within our society to do things instantly, no matter what the cost. People are becoming more and more desperate to lose weight, and some are taking very drastic action to get the bodies they want. I came to the conclusion that fighting this demand for instant results wasn’t going to benefit anyone; people were going to continue to seek ways to drop pounds, regardless of the health implications. It seemed to me that it made much more sense to help people to achieve their goal in the healthiest way possible. Designing a rapid weight-loss diet based on nourishing meals would not only give me an opportunity to educate people about the benefits of wholesome food, but also show them that it is possible to eat nutritious food, lose weight and look and feel great throughout the process. In my professional capacity as a scientist, I used my knowledge and skills to design a diet that cuts through the hype, fear and greed that currently underpins the weight-loss industry. I concentrated on factual, state-of-the-art research into the nutritional benefits of natural health foods, and their ability to work together to support weight loss in a simple, effective way. As a woman, I am a mother, a daughter, a friend, a colleague and a lover, and I care deeply about the health of those I love. I fear for my daughter in a world that celebrates a quest for celebrity-style emaciation. The near-skeletal female forms in some glossy magazines terrify me, and make me fearful for the future. By creating the Drop Zone Diet I hoped to re-educate the palates of my clients so that they would naturally veer towards healthy, life- giving foods when they were tired, stressed and busy, rather than turning to junk foods that caused the problems in the first place. I was recently working as a consultant for one of the world’s leading sports brands, and one of the make-up artists told me that some models sent to Africa for assignments secretly hope to get chronic diarrhoea while there, to help them look thinner on the shoots! Young women have gone to extreme lengths to achieve tiny sizes. The ‘cotton-wool’ diet is just one example. Yes, people do actually eat cotton wool to fill up their tummies. The lunacy is terrifying. I designed the Drop Zone Diet to help women (and men) lose weight quickly but sensibly, without risking their physical and emotional health in the process. The weight-loss industry has increased dramatically over the past two decades, with snack bars, drinks, powders, patches, sprays and all sorts of tablets and meals in packets now readily available. The manufacturers are savvy. They’ve done their research and know that we will probably do almost anything to get the body we want so much. We’ll even overlook health risks if instant results can be achieved. They feed us up to thin us down again, all the while gorging on our insecurities. No one wants to be caught in the ‘ring of shame’ in the glossy magazines. Unflattering ‘zoomed-in’ photographs of the physical flaws of people in the public eye are printed for readers to comment on and gossip about. Celebrities are so terrified of not having the perfect bodies they take drastic measures to stay thin (often too thin). Unfortunately many people then follow their lead. We don’t stand much of a chance when the giants of media and manufacturing work their magic in the supermarkets, even employing psychologists to help them defeat us. We know what we should be eating, but how can we avoid being tempted by products that are cannily packaged and advertised, and then placed directly at eye level when we scan the shelves? Within the supermarket we are a captive audience, often buying on impulse. The food industry is designed to take advantage of that! Long-term weight loss relies upon sticking firmly to a goal and ignoring (as much as possible) the temptations around us. That’s hard to do when we are hungry, tired and in need of instant energy and maybe even comfort, but it is possible to create change. By feeding your body healthy, natural food, you won’t crave junk. You’ll have stable energy levels throughout the day, so you won’t end up shovelling in rubbish. The Drop Zone Diet has been created to do just that. You’ll sleep peace- fully and wake up refreshed and raring to go. This will feed your determination to succeed, and as you become happy and at peace with your shape, you’ll actively seek out the foods that make you look and feel so fantastic. When you begin a diet, do you find that you crave good- ies more than ever? Do the advertisements seem brighter? Do the chocolates look more meltingly delicious, the bread smell yummier? It can seem like an endless battle to stay on the straight and narrow, but there is a solution. I call it ‘putting down the rope’. It is possible to end the struggle by making the decision not to engage in it any longer. Imagine yourself playing Tug of War against an opponent. The harder you pull, the harder they pull. But when you put down the rope, the game is over. The same goes for the war against overeating – or choosing the wrong foods. When you are really pulling (trying hard to be good), it somehow seems much harder. I suggest you put down the rope now, which signifies that you are psychologically ready to proceed – you are ready for an adult relationship with food, ready to embrace the long-term impact of making good, nutritious choices. You are not denying yourself because you genuinely won’t want or need unhealthy food any longer. If you can establish this frame of mind at the outset, you’ll find that the temptations simply don’t have the lure they once did. You aren’t playing that game any more! I never realized how bad I was feeling until I did the Drop Zone Diet. I knew I wanted to lose weight and was constantly on the search to find the holy grail of quick fixes. I have literally done every diet on the block. And last year I felt a massive pressure to lose weight when my husband and I were invited on a company trip to Dubai with all the other sales reps and their partners. I really didn’t want to be a white, beached whale next to some real beauties by the pool, so I went to some ridiculous extremes to lose weight. I bought slimming tablets and went to spas to get ‘sucked’ by hydrotherapy and other treatments. It cost me a fortune and didn’t work. Stupid! A colleague recommended the Drop Zone Diet and it transformed my life. I had forgotten how it feels to have energy. I was so tired all the time that I just got used to it. I used to try and crawl my way out of the ‘tired pit’ by existing on cakes and biscuits for energy, but that just made me heavier and more sluggish. Once I’d done the diet I had real energy – proper full-on bounceability – that meant I got home from work with plenty of energy to do things in the evening. The weight dropped off easily. This diet changed my life and my confidence has soared. 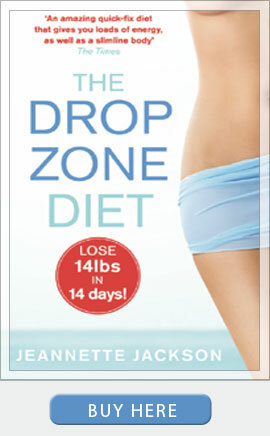 I created the Drop Zone Diet for you and for every friend and client who has begged me to help them lose weight. This is an extreme diet, because I know that you want results – and fast. In fact, if there is one thing I’ve learned over the past couple of decades, it is that people need to see a shift almost immediately. If they don’t see the desired outcome in a short space of time, they quickly move on to something else. We live in a quick-fix society and we’re becoming increasingly used to getting what we need at the click of a mouse. Did you know that the average person spends just seven seconds on a website before deciding to click or move on? That’s three blinks of an eye! By ensuring that you see results – and by making the diet abundantly achievable – the Drop Zone Diet will take you off that merry-go-round of faddy, perpetual dieting. You can definitely lose up to 14 pounds in 14 days, on a diet that will feed the very core of you: your liver, your spleen, your brain, your skin and even your emotions! Your body will devour this diet, and positively sigh with relief that it is finally getting what it needs to function at optimum level. I am deeply proud of this diet and the results it achieves. I’ve been picking up the pieces of the weight-loss industry for far too long now, and really want to offer something healthy and positive to help people make the changes they want towards happiness, health and balanced weight. It may be quick, but it’s not a ‘quick fix’ because it changes the way you think about food in the long term. The Drop Zone Diet is a soothing balm in our barmy world! I want to help you get back to ‘you’. You are strong. You are tenacious and you have spirit. If someone you loved was in danger, you would roar like a lion and stand between him or her and a speeding truck. However, somewhere along the line you have forgotten to do this for yourself – forgotten how to protect yourself with the same vigour and determination, to care for yourself with the love that you offer to others, and to want the very best for yourself, just as you do for them. Let’s draw on that strength and spirit now. Are you telling me that you can continue to be defeated…by a doughnut? The time is right for change and you are ripe for good health. Let’s get started, and enter the Drop Zone together.